This month’s excerpt comes from the section in Chapter 3 of Travels with Baby: The Ultimate Guide… called “Staying Safe (and Sane) with Friends and Family.” I hope it helps boost your confidence (and perhaps your humor quotient) as you pack up for your trip, and helps your family have a truly enjoyable stay with your friends and loved ones. 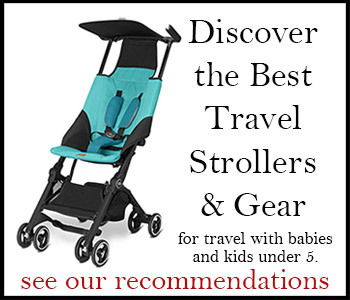 Also, remember these other posts you may find especially helpful this month: The comprehensive roundup of Top Tips for Holiday Travel with a Baby, Toddler, or Preschooler; and also The Best Holiday Gifts for Travelers Under 5 Years. Staying in the home of friends or relatives is by far the most common first trip new parents make with their child, and for many, it’s likely to be a repeat occurrence through the baby, toddler, and preschool years. Yes, having access to all the comforts of home, including a full kitchen, laundry facilities, separate quarters for your napping child, and of course, the loving presence (a.k.a. help) of your friends or family, can be a wonderful, relaxing way to vacation with your child. It can be, in many cases, with some good planning. First, you will need to get grounded in reality. As a guest in someone else’s home, you will be obliged to observe their daily rhythms and routines. Enthusiastic pets, light-saber-wielding children, steep staircases, toxic houseplants, precariously perched lamps, thimble (a.k.a. choking hazard) collections, and more may await your little family at the well-intentioned relative’s home. Just establishing a safe place for your child to sleep or play during your visit could prove challenging. Add to that the possibility of delayed bedtimes, extended meal times, and noisy visiting hours and you may find yourself wishing for a night off at the local motel. As well, take your hosts’ lifestyles into consideration—in spite of their best intentions, would having a baby or small child under their roof full time prove a major inconvenience to them? Try to get your hosts on the same page before you arrive in their home. Describe a typical day with your child at home, when he usually rises, naps, how often he eats, and what his sacred rituals are. Tell them how much you are looking forward to seeing them, but be honest about your concerns—including upsetting their own routines (like, perhaps, sleeping). Share your ideas of how you can help with childproofing concerns and other details about having a baby or small child in their home. Especially where friends and family are concerned, it could be well worth spending a little more to stay nearby and come for visits if it means safeguarding the integrity of your relationship. That said, here are some friendly suggestions for how to avoid some common pitfalls and have a safe, sane visit with those who are near and dear to your heart. Your hosts may not be as prepared as they think they are for dealing with the thrills and spills associated with baby and toddler dining. If your child is using a portable dining booster, ask your hosts for an extra bath towel you might use to protect their chair from any overboard spills or splats. Pack a vinyl tablecloth (like those used outdoors) to spread beneath your child’s seat to protect your hosts’ floor during meal times. Afterward, you can simply shake off the crumbs and wipe the surface clean. Also, bring along your child’s own plate or bowl to save your hosts from searching for suitable dishes or risking breakage of their own. As Benjamin Franklin said, “Guests, like fish, begin to smell after three days.” Guests in diapers, however, may smell upon arrival. Be sure to check with your hosts early on to see where they keep their outdoor trash so that you may use it when needed. Bring your own supply of plastic bags and export any stink bombs straight away. Also, be thoughtful on disposing of wet diapers; some people bristle at the sight of perfectly harmless puffy Pampers in their bathroom wastebasket. It may be simplest to bring your own sack or trash bag for collecting these in your quarters rather than filling up your hosts’ wastebaskets. I’ll say it until I’m blue in the face: Earplugs can make a thoughtful and humorous hostess gift. If your child isn’t likely to make it through the night without a vocal interlude, give your hosts fair warning. They can take any precautions to help ensure a restful night for them (using aforementioned earplugs, closing their doors, indulging in a nightcap, and so on). This will also help prevent them from worrying if your child is feeling well or if you need their assistance or intervention—Uncle Larry’s “Get Happy!” clown dance could prove disastrous at three a.m. Anywhere you stay (a hotel, a campsite, a sleeper car) you will have to size up potential dangers to your child and deal with them the best you can. But when you stay in someone else’s home, the number of potential dangers may actually increase. In addition to the more easily anticipated risks like stair steps, sharp corners, and electrical outlets, you may also face a few surprises that come with staying in an active household of friendly folks who may not be accustomed to playing “What’s Under Grandpa’s Easy Chair?” or, with toddlers, “Look What I Found in the Kitchen Trash!” Just make sure you don’t overlook these potential hazards while in the throes of visiting. Also, don’t overlook the hazards your child might pose to your hosts’ home. Other adults may not be as tuned in to the potential consequences of leaving some items within a child’s reach, or the lightning speed with which a child can perform magic tricks with table cloths (swoosh!) and car keys (flush!). Especially if you’ll be visiting with a curious toddler, you will need to stay two steps ahead of your child where these items may be accessed. Have a safe and wonderful holiday season, and make sure you take lots of pictures! (I know you will.) I will see you in the new year. I wish everyone who travels with small children reads this, it’s so hard to see a young family struggling with a toddler who just cannot be soothed on a flight non-stop for 12 hours. They scream themselves to sleep out of acute pain being cooped in one position the entire time, and the parents are so embarrassed at the discomfort of their neighboring passengers, who (if they have children at all) have forgotten what it was like when their own were small. I love these tips. So many parents are discouraged to travel and stay anywhere else but their own homes with little ones… but it is definitely doable! I so wish this were out when my boy was a toddler. Visiting inlaws was like running a marathon – it was hard to rest from being vigilant. Ha! I hear you, Elaine! 😉 Can you say, “Hummel figurine collection”?